With a low cost of living, friendly locals, and fascinating culture, the beaches of Southeast Asia can be ideal destinations for those looking to retire on a modest Social Security income alone, according to a new report from InternationalLiving.com. While an average Social Security benefit of $1,341 a month might not stretch that far Stateside, in some locales in Southeast Asia, that is plenty to fund a genuinely comfortable life lived at a relaxed pace, with all the benefits of sun and sand nearby. With a low cost of living, friendly locals, and fascinating culture, Southeast Asian beaches are so much more than exotic vacation spots. Life for retirees in Southeast Asia can be almost unbelievably inexpensive. While an average Social Security benefit of $1,341 a month might not stretch that far Stateside, in some locales in Southeast Asia, that is plenty to fund a genuinely comfortable life lived at a relaxed pace, with all the benefits of sun and sand nearby. Not all Southeast Asian beach destinations are created equal, however. A recent International Living report identifies five of the best beach towns and cities in Southeast Asia where retirees could easily live on their Social Security alone. Since the King’s move, Hua Hin has become the “in” place among upper-class Thais. In the last few years, the number of international restaurants has grown exponentially—mostly Italian and “European.”. And it’s also a favorite with golfers. The city has nine golf courses, with green fees currently ranging from $60 to $100. At present, the expat numbers are relatively small, and limited to foreigners interested in adopting a quieter lifestyle while still enjoying a string of shoreline restaurants where a couple can eat for less than $10. Prices at food stalls around the Night Market are almost as modest as anywhere else: Most dishes cost less than $2. “The main attraction here is the beach. People don’t come here to do stuff, they come here to relax,” said Robert Stanley, originally from Canada and owner of Bobby’s Bar & Restaurant, a popular expat gathering place at the south end of Hua Hin. For beachside living, it is still a relatively inexpensive place to lead a comfortable lifestyle. Many expats are living on $2,000 a month or less. That is enough to provide them with a small house or condo and plenty of funds to enjoy the restaurants and bars around town on a regular basis. Many foreign retirees opt for a new life on Penang Island, a 50-minute flight from Kuala Lumpur, Malaysia’s capital. It’s also accessible by an eight-mile long road bridge and a ferry from the mainland that runs 24 hours a day. A second bridge was completed in mid-2014. One of the oldest outposts of the former British Empire, Victorians christened Penang “the Pearl of the Orient.” It lies anchored on the Spice Route, just off Malaysia’s west coast, a two-hour drive from the borders of southern Thailand. In the north east of the island, George Town, the capital, has most of the island’s hospitals, art galleries, museums, antique shops, café culture, and some of Malaysia’s oldest colonial administrative buildings. Penang International Airport is 40 minutes outside the city center. The expats who live here want city living with a big village feel, and that’s exactly what they get. A couple can easily live on $1,500 per month, including rent. A three-bedroom, two-bathroom apartment in a great location in George Town can be rented for $450 per month. Sihanoukville is a relatively small tourist city, with a population of less than 90,000 people. But due to its stretches of popular beaches and clusters of undeveloped islands, it is Cambodia’s most popular coastal resort. After Siem Reap and Phnom Penh, Sihanoukville is where foreign tourists and expats, as well as Cambodians, come to relax and enjoy the ocean breeze. 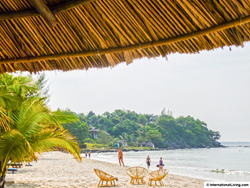 For many local expats and those who like to visit Sihanoukville for long weekends, Otres Beach is the best option for relaxation and a laidback environment. By far the most unaffected by development, Otres is the beach that expats in the know go to when they want to kick back with a beer at one of the beachside stalls or go for a swim in the crystal-clear water. Between 2,500 and 5,000 expats live in Sihanoukville full time—a number that increases during the high season, from October to May. And those expats are living the high life on low budgets. Some report spending just $1,200 or less a month. Surprisingly, given its population of about a million, there is little hustle and bustle in Da Nang. There are, however, lovely parks, riverside promenades, and a long, un-crowded, powdery sand beach. Da Nang residents are relaxed and social. It might be the easiest place to meet people and make new friends in all of Vietnam. It is considered one of the least-corrupt cities in Vietnam, and city planning has insured that growth will not come at the expense of quality of life. Da Nang’s expat community has flourished in the past few years. It used to be that most of the town’s expatriates were either English teachers or employed at one of the local information technology companies. Now, a sizeable influx of retirees are coming here to settle down, too. Many people have settled in Da Nang because of the beach, which is certainly one of the prettiest in Vietnam. In 2013, Forbes voted it as one of the world’s six most attractive beaches. Expats here can easily live on their Social Security benefits alone. Mel Potter, originally from California, rents a two-bedroom house for $300 a month. That includes air conditioning and all utilities—water, cable, internet, electricity. The seaside town of Dumaguete in the Philippines is home to around 4,500 expats. It’s famed for its energy and vibrancy, thanks to seven universities and colleges. The ﬁrst private U.S. university in Asia is here—Silliman University. This in turn houses the best private hospital in town, where a private room goes for just $56 a night. And that’s perhaps the biggest draw for expats…a seriously affordable cost of living. Meals can be had for less than $5 and rent for under $350 a month. The airport is only about 15 minutes from the downtown, and there is no need for a car or scooter in town. The real hub of downtown is only about eight blocks long by ﬁve blocks wide. At the heart of town is Rizal Boulevard, with its wide, waterfront promenade and beautiful old trees arching toward the ocean. Many expats meet in the restaurants and bars along the boulevard. It’s the best place to take advantage of the cool ocean breezes and some of the town’s best restaurants for local and international food. Rent for a three-bedroom, two-bathroom condo in the heart of town can be had for as little as $100 to $350 a month, although the quality and furnishings may vary. A housekeeper is $3 to $4 a day, and a gardener for that nice beach house will only be about $4 to $5 a day. Dave Christopherson moved to Dumaguete to enjoy a slower-paced life that revolves around golfing, snorkeling, spending time with his family, and socializing with both locals and expats from around the world. Dave, his wife April, and their son Davey live in a one-bedroom condo right in the middle of town on their $1,500-a-month budget. “Some expats do it on less, but I like to golf, travel some, and eat out a lot,” says Dave. The full International Living report contains more information on cost of living and other details about the five best Southeast Asian beach towns for retiring on a Social Security budget. Find the International Living report at: Five of the Best Beach Towns in Southeast Asia to Retire on Your Social Security. For information about InternationalLiving.com content republishing, source material or to book an interview with one of our experts, contact Associate Editor Carol Barron, 772-678-0287 (US), CBarron(at)InternationalLiving.com or visit the Media Center.